I'm back and I have a new outfit! You can't go wrong with a white top and jeans. These two never go out of style. This is a very simple and chic combination. It's my signature look. When I can't take any risks and therefore have to look on point, this is it. I love the delicate texture of this sweater. You can feel the quality. This sweater is by Bimba Y Lola. I discovered this amazing brand the first time I was in Barcelona. As a result, I have always been on the hunt for their amazing pieces since that first trip. Thankfully, Bimba Y Lola's boutique is near me in Richmond. I visit there as often as possible. My normal wardrobe tends to be muted, reserved. Since vibrant colors are Bimba Y Lola's strong suite I make very calculated choices. Because of this I will say I am pushed out of my comfort zone sometimes, which is never bad! Everything I've ever purchased at Bimba fits. Fits my style, my aura, it just fits perfectly in my wardrobe. These pieces become key aspects of my look. When I think about myself in high school, I always remember myself wearing flared jeans or trousers. Probably it was a trend back then. However I remember myself being confident and stylish. 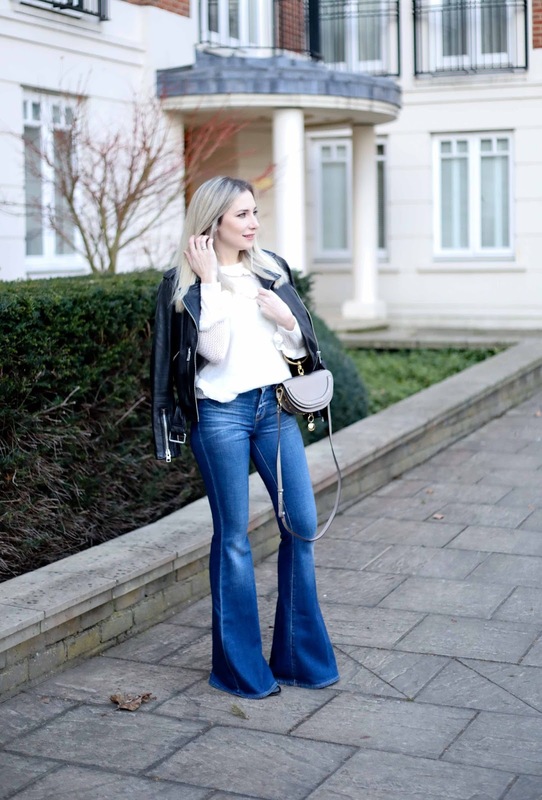 This pair of flared jeans was on Net-A-Porter site. They are perfect. These jeans are comfortable and very flattering. The length is great for my quite petite height (5'3''). No need to alter them. I am trying to post more often. Hopefully at least once a week. I would love to hear what kind of content you want to see more of. Shopping, beauty, outfits? Let me know what you need. If you like this post please share with your friends and check my Instagram account. Bag - Chloe Minaudière Nile.